Check all gates to make sure they are shut and locked. Install self closers on gates to make sure they close properly. Leash walk dogs inside a fenced in yard until the holiday is over. Even inside a fenced in yard, loud noises can cause a hound to jump and they might clear a fence. A terrified dog can dig, jump or even squeeze out of a small area. If you have to leash walk, try to schedule the walk when it is less likely that you will encounter the loud noises. Minimize the slack on the leash and keep the hound closer in case he/she panics (keep the hound within grabbing distance). Supervise during turn outs. Do not leave a hound outside by itself. Check all collars for wear and tear and make sure your ID tag is on and up to date with accurate phone numbers. Keep your hound inside as much as possible and cut down on the number of outside breaks. 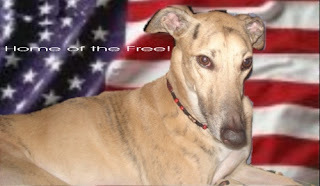 Under NO circumstances, take your hound to picnics or outdoor events where there are fireworks. Do not assume anything! Joey wishes everyone a safe and accident free July 4th holiday!